What happens when the physical body and the subjective sense of self part company? How do we explain phantom limbs and alien abduction? What are the cognitive, neurobiological mechanisms that support such phenomena? In this special issue of Cognitive Neuropsychiatry, Spence and Halligan explore all these issues and more, with contributions drawn from an internationally renowned panel of authors, most of whom contributed to a symposium held in Sheffield, England in June 2001 ('The Neuropsychiatry of the Body in Space'). That meeting was primarily concerned with those bizarre and disturbing syndromes that arise when 'body' and 'self', soma and psyche are dissociated from each other, within or beyond the body's surface. Some disorders constrain the space of the body (as in neglect and dissociation syndromes), others seem to extend the boundaries (as with phantom limbs and autoscopy). Still others suggest a permeability of those boundaries (as in alien control and thought insertion, each occurring in schizophrenia). Finally, the body may itself be perceived as having passed into space, the most extreme exemplar being 'alien abduction'. Each paper contains a description of disturbed phenomenology and an account and critique of current cognitive neuropsychiatric findings. S. Spence, P.W. 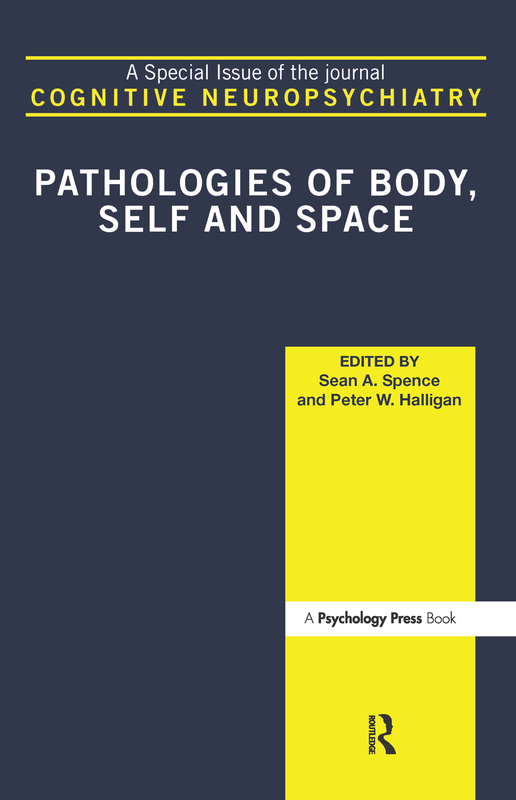 Halligan, Editorial: Pathologies of Body, Self and Space. K.J. Holden, C.C. French, Alien Abduction Experiences: Some Clues from Neuropsychology and Neuropsychiatry. P. Brugger, Reflective Mirrors: Perspective-Taking in Autoscopic Phenomena. M. Husain, The Cognitive Neuroscience of Hemispatial Neglect. S. Spence, Alien Motor Phenomena: A Window onto Agency. R. Brown, The Cognitive Psychology of Dissociative States. T. Thornton, Thought Insertion: A Symptom too Far for Cognitivism? P.W. Halligan, Phantom Limbs: The Body in Mind.